Dubai, UAE, May 21, 2018: Ideal Standard, one of the leading providers of innovative bathroom solutions operating across Europe, Middle East and Africa, has released its latest stylish and versatile ceramic range, Strada II. Building on the success of the original Strada range, this collection of vessels, vanities, basins, toilets and bidets offers soft angles, fine edges and contemporary curves to help bring to life modern, beautiful bathrooms. Created by leading industrial designers at Studio Levien, this range maintains the simplicity of the original Strada collection, while offering a softer, lighter design in line with current tastes and trends. Today’s consumers want flexible products to fit any bathroom design. That’s why all products in this range perfectly complement each other to fashion a perfectly harmonious bathroom. Strada II offers Ideal Standard’s most flexible basin range, with options to fit every design scheme in a range of sizes and models. Options include washbasins, vessels, vanities, under-countertop and semi-countertop in sizes ranging from 40cm to 120-cm. Products offer different installation options, so one can opt for wall-mounted, positioned on furniture/worktops or combined with a semi-pedestal. Studio Levien has included a clever rim on a number of models, which not only enhances the design, but also helps prevent objects from falling from the basin. Cleanliness is vital when it comes to the bathroom and toilet bowls, which is why Strada II features Ideal Standard’s patented AquaBlade® flushing technology. It provides a more effective and efficient use of water, while improving flushing even at low water volumes, with no impact on the design. This technology ensures that 100% of the bowl below the channel is cleaned, meaning users save time and resources maintaining the products. AquaBlade® is also proven to be 62% quieter than competitors’ rimless bowl models. You can choose from wall-hung, floor-standing and close-coupled toilet bowls, along with wall-hung and floor-standing bidets. They are fitted with easy to remove seats and covers, which allow for quick cleaning. A number of models also have hidden fixations to not only keep the design intact, but reduce the places where dirt can collect. 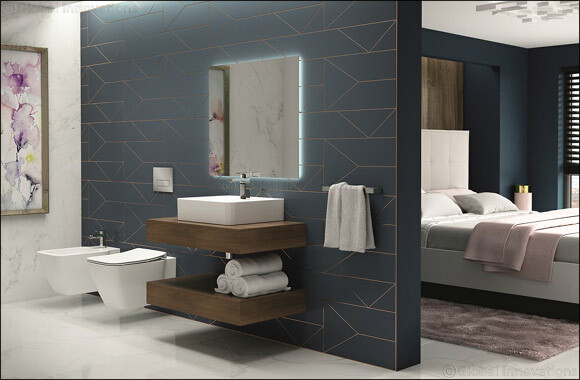 Understanding nowadays consumer’s need for products which fit seamlessly into any bathroom, Strada II was designed to be compatible with a range of Ideal Standard storage solutions, and specifically Tonic II, Connect Air and Tesi furniture ranges, which are both practical and elegant. The company also has a collection of mirrors that further complement Strada II.